The active integration process in CIS markets towards the formation of the Eurasian Economic Union coupled with the increased awareness of Islamic finance in Russia and CIS countries such as Kazakhstan, Kyrgystan and Azerbaijan have spurred investor interest but locally as well as internationally. 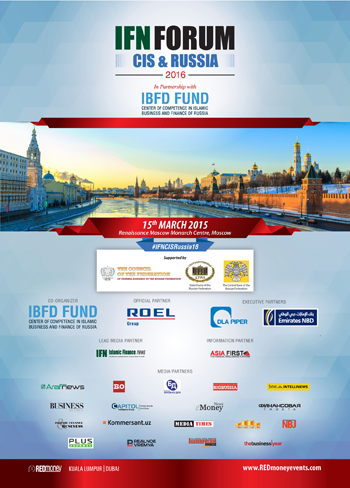 REDmoney Events in partnership with the Islamic Business and Finance Development Fund (IBFD Fund) will organize the IFN CIS & Russia Forum on the 15th March 2016 in Moscow. The event is expected to draw market players and regulators from key Islamic finance markets globally and within Russia. The Islamic Finance Forum has been held in the Russian capital to promote ties between Russia and the Eurasia region. Business and financial leaders say Iran will play a key role in creating economic opportunities in the region in the post-sanction era. Presentation: Capturing the Opportunity for CIS and Russia: What Have We Learnt so far from the growth of Islamic Finance around the world? What is driving the push for Islamic finance in the region and what opportunities the new sector is to offer the market? Continued support from tax authorities to provide for an equal playing field for Islamic and conventional capital-raising products is essential to develop the market: How can regulators better cooperate with the industry? What specific regulations/legislation will help develop regional Islamic finance agenda? Possibility of a sovereign or benchmark Sukuk issuance: Will sovereign Sukuk boost the sector in the region? What impact will the development of Islamic finance have on the proposed Eurasian Economic Union? How will Islamic finance activity facilitate the development of Russia’s resources in oil and gas, energy, agriculture and the Halal industry? Examining the banking industry landscape in the CIS region and Russia: What foundation exists for the introduction of Islamic finance to the greater region? What role could CIS countries with already established Islamic financial institutions play and what lessons could be drawn from their experience? Branding and capital injection: Should these newly established Shariah compliant financial institutions be branded as Islamic, alternative, ethical or otherwise? Or, should established conventional banks simply take the path of setting up Islamic banking windows? Starting with small capital or ride on the existing liquidity of the conventional parent bank? How should the region position itself in the increasingly competitive Islamic finance market? What are its inherent advantages and limitations? How can Shariah financing assist in sovereign capital-raising and infrastructure projects? What needs to be done for this to happen? Alternative funding strategies: What options are open to corporate issuers in Russia and the CIS region? How can Russia’s SMEs benefit from Shariah compliant capital-raising products? How to make potential corporate issuances in the region attractive to foreign investors? Investing in Russia and the CIS region in comparison to other Islamic finance destinations: costs, legal considerations, opportunities and sectors. What investment climate should exist in Russia in order to attract more foreign capital? What role Islamic finance can play in attracting foreign investment? Which sectors and asset classes are likely to attract foreign Islamic investors?